How do you know what they want, what they really, really want? 90’s music references aside, how do you know what types of emails people want? I mean, we know they want emails. Emails are a marketer’s best friend. According to MarketingSherpa, 61% of consumers enjoy receiving promotional emails weekly (and 38% would like emails even more frequently). And you can tell what types of emails they want based on who they are (and what they do). Segmentation helps you understand what people want—and give it to them. Platinum Skin Care, an ActiveCampaign customer, converted 17% of their leads into paid customers using audience segmentation. Automatically. How nice is that? There are a lot of reasons to use segmentation, but here’s what it comes down to – segment your audience if it contains multiple groups of people who care about different things. Then send them these 10 types of emails based on their segment. Are you sending any of these top 10 recommended email campaigns? Here are the top 10 types of emails to send your customers. True or False: You should send a newsletter email. According to a survey by research firm Nielsen Norman Group, 90% of people prefer to receive company updates via email (10% prefer social media). 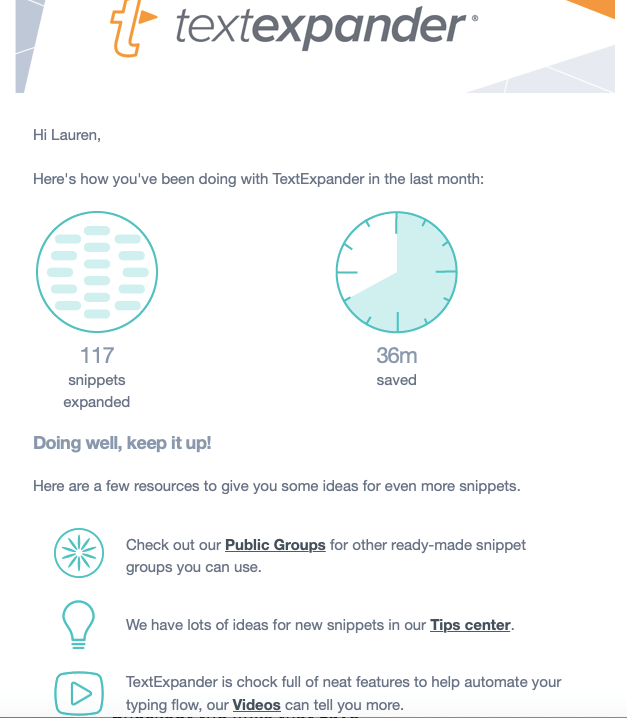 Here’s what a great newsletter looks like, courtesy of Fitbit. This monthly newsletter gives you content that targets the things you would use a FitBit to help with. All of this supports a core message – you know FitBit has products to track your health. Only at the end of the email is there a direct mention of the product. The content of this newsletter isn’t telling FitBit subscribers “love our brand.” It’s telling them “here’s how to love yourself.” And it ends on a CTA helping them get what they need to do it. 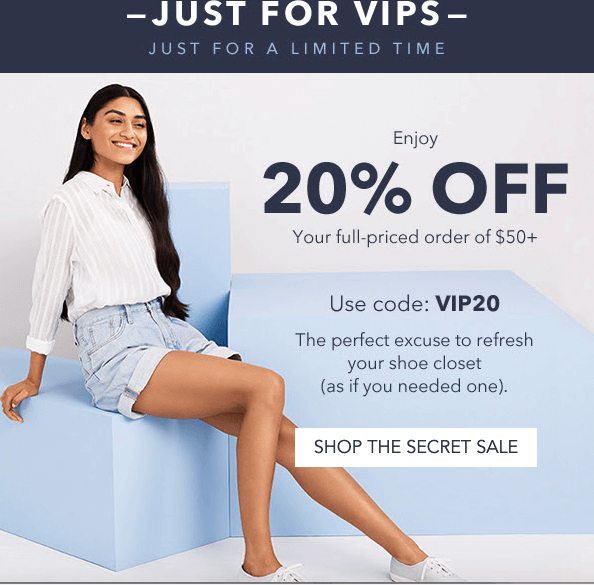 Offer emails include discounts, coupons, or other special deals that VIP subscribers get as a “thank-you”. I’m a fan of comfortable shoes that last for years, something the classic brand Keds knows well. Here’s an example of an email they sent exclusively to customers like me. Oooh, a secret? Tell me everything. Not to “discount” the discount (because of course we all love getting those), but the biggest takeaway from this offer email is the targeting. One of Robert Cialdini’s persuasion techniques is scarcity, which means making things exclusive or only available for a limited time. It’s a natural reaction to think that something is worth having because only so many people can actually get it. Making an offer exclusively available to VIP customers makes it infinitely more appealing (and you’d better believe I bought some shoes). A milestone email that celebrates a victory can help your readers feel special. The Skimm is a current events newsletter aimed at millennial women. See what makes their 5-year milestone thank-you email a success. The Skimm is thankful for your help reaching this milestone, but they don’t just say it – they show it. 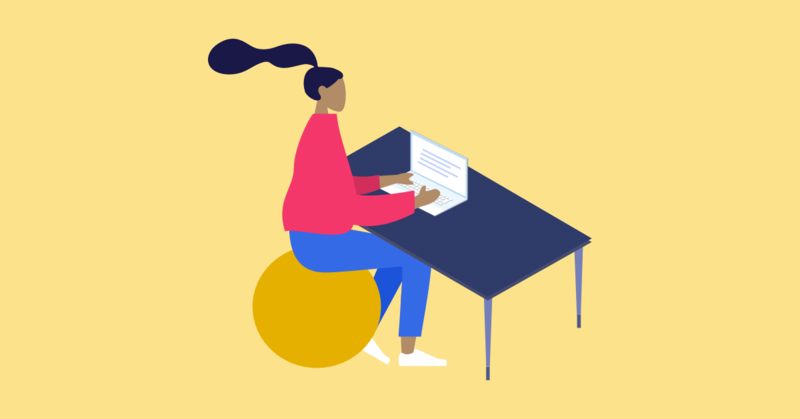 Anyone can give a blanket thank-you in a milestone email, but The Skimm takes you on a journey to show you exactly how your subscription benefits you and them. Plus, they use numbers. Numbers are concrete, indisputable proof that the time spent engaging with a brand was worth it. You put in the time, they noticed, and they are able to keep going because of subscribers like you. Research shows that 91% of people regularly or occasionally read online reviews – and 84% trust online reviews as much as a personal recommendation. In other words, you must have reviews for your brand. Asking for a review is the best way to get to know your audience. And the more you know them, the better you know what emails to send them. 68% of customers form their opinion of your product after reading between one and six online reviews. Don’t have 1-6 online reviews? Time to send some emails. LOFT is a popular women’s clothing retailer (whose website I frequent regularly). The one thing I always do is check reviews for sizing caveats and other wearing experiences. And they know just what to say in their review request to get that info for me. The following review request email example from LOFT is perfect from the subject line down to the content. A $1000 just for my thoughts? You sure know how to make a girl say HECK YES. I’m a frequent LOFT shopper (definitely more than I should be on a budget) and, of course, I want a chance to get some free money. But what’s even better about this is the copy offering it. 1,000 is a big number. One thousand. Say it out loud. It feels good, right? It stands out and makes you look twice. This kind of copy is hard not to click on. Welcome emails are the cash cow of emails: on average, 320% more revenue is attributed to them on a per email basis (over other promotional emails). And you need them. This is not a debate. “There’s one email that gets a higher open rate than all others: the welcome-to-my-list email. It’s no surprise. The recipient is at their peak interest. They just converted into a subscriber, so they are want your content and trust your brand. Setting this auto-response it a no-brainer. Opens and click through rates are often 2x any other emails you send. 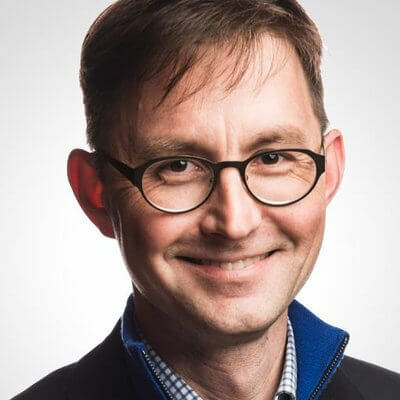 – Andy Crestodina is a marketing expert, thought leader, and co-founder of Orbit Media Studios. He’s an expert in SEO, web design, and using data to guide marketing strategy. Cool? Cool. Let’s dive straight into a killer example of a welcome email from Lyft. It’s really easy to turn a welcome email into a long ode of thankfulness that a customer is officially on the list. That may seem like a nice opener, but honestly? People who are new to your list don’t want an ode. Clear, immediately useful information about what you can do for them. This Lyft welcome email example uses copy that leaves nothing up to interpretation. Their service is fast, trustworthy, and cost-effective. Bam. Done. Plus an actionable CTA literally saying “Take a Ride” – this welcome email tells you everything you need to know to start using the service. Curated content is a collection of relevant, high-quality content. It can mean a collection of content pieces related to one topic, or it can be curated info from other content used in a new content piece of your own. Often it’s the first option, like this curated content email from Really Good Emails. So how do you do content curation well? Pick a relevant topic, and then pick relevant content. Easy enough, right? Does my audience need to solve this problem? Is there enough data here to support further analysis and discussion? Do I trust this information and where it came from? If I expand on this content, will it strengthen my brand? Do I have a unique perspective that hasn’t been fully explored yet? If the answer to all of these questions is yes, then you’re looking at a topic that’s worth covering. Here’s an example of a curated content email from greeting card designer Postable. 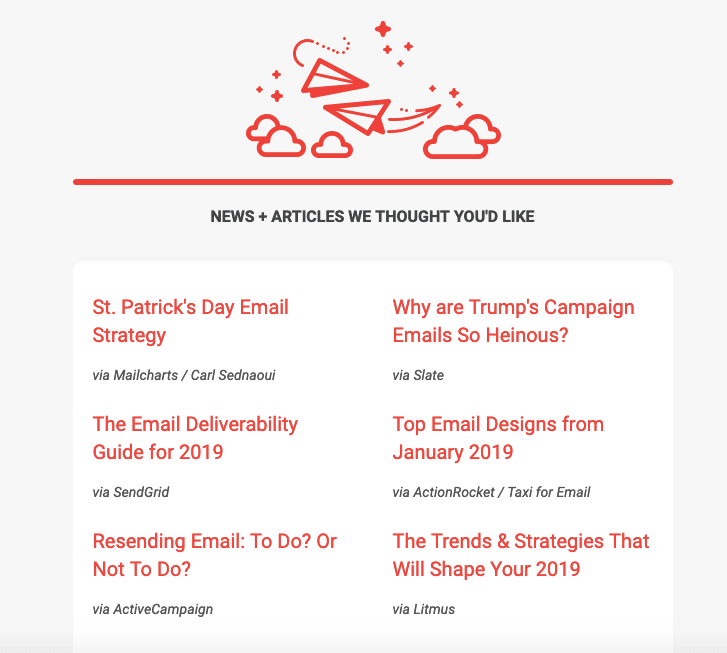 If you are a subscriber to a greeting card company email list during a high-volume holiday card time, what more could you want from a curated content email? When you have a new product coming out, the first people to know should be on your email list. Did you know you can see 60-70% more conversion success selling to an existing customer (versus 5-20% success selling to a new one)? The quickest way to boost sales is to sell to the people already buying from you. Nokia “nose” (you’ll get it in a second) just how to hit the right notes of useful, funny, and clever in this new product email for the Nokia Home launch. If someone else you that a new product was worth your money, wouldn’t you feel better about trying it too? Research from Moosend shows that abandoned cart emails have an average open rate of 45% – and an average clickthrough rate of 21%. Half of those people make a purchase. That means that a single abandoned cart email could convert 10% of the people getting it into customers. Whiskey Loot isn’t just reactive in their abandoned cart email –they’re proactive against every reason you might still try to defy your Whiskey Loot purchase destiny. It’s always easy to find a reason not to do something. This abandoned cart email doesn’t just ask you to come back to your cart; it gives you 7 reasons why completing your purchase is a good thing (the cheapest trip to Scotland you’ll find anywhere). If those 7 reasons aren’t enough to convince you, the email also addresses each question still holding you back. Why do we get report cards, use scales during a weight loss challenge, or have annual reviews at work? Because progress is a motivator. Seeing proof that our actions have made a difference makes us want to keep going. It’s all well and good to keep pushing your customers through different stages of the product funnel, but how can they be sure that it’s worth it for them? A regular progress email is one way you can show them. TextExpander, a productivity software that creates typing shortcuts, has a good monthly progress email. Anyone who has ever tried to stick to a diet knows that it’s not easy. Eventually, a lot of people plateau, and it’s hard to keep motivated. A 2013 study published in Translational Behavioral Medicine showed that participants who published their weight loss progress publicly lost more weight than those who kept it private. This TextExpander progress email keeps you around by showing how far you’ve come – giving you what you need to keep going. No doubt that you have a lot of useful content at your fingertips. Share it! A confirmation email is a transactional message you send to your website visitors and customers as proof of a completed action. Here’s a confirmation email example from Airbnb. What’s one thing that customers really hate? When you make things difficult. Whether that’s finding information, going through a checkout process, or trying to get a human on the phone for support help, making it harder than it needs to be is a quick way to lose customers. Confirmation emails are one of many types of triggered emails that you can set to send automatically. Now you don’t have to worry – and neither do your customers. Hey, maybe even automatically send yourself a confirmation email to confirm that your other confirmation emails went out? No that’s too much… (or is it…). Conclusion: How many marketing emails are too many? A survey by MarketingSherpa showed “at least monthly” and “at least weekly” as the most popular answers to how often people want to hear from brands. Truthfully, it will depend on what email campaigns you choose to send. Before you get trigger-happy with your “Send” button, remember – there’s such a thing as too many emails (no matter how great you think they are). Sending frequency isn’t what you need to worry about. Or at least, it isn’t the main thing. Customers want promotional emails, but they don’t want a million emails with content doesn’t matter to them. 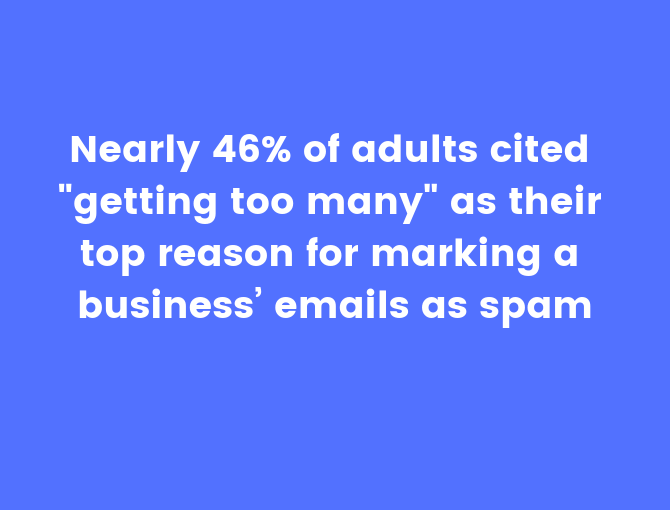 That same study found that nearly 32% cited irrelevant content as their spam-marking reason. What’s most important to your customers? What’s most important for your business? The quality of the email will always be a priority over how often you are sending them. Here’s one example from Perfect Keto to show you what I mean. One of the most challenging parts of the Keto diet is learning how to eat out or on-the-go – because it’s not as easy as grabbing a granola bar or ordering a salad. That’s why when you’d just have to click on this kind of email. The subject line and preheader text worked together to earn my click. One keto blogger sends me A TON of emails and truthfully? The volume can get a little annoying at times. The rest of the email offers a targeted solution to those problems: travel keto snacks to take on-the-go. This is just one of many emails like this that I get from Perfect Keto, but the content hits the nail on the head every time. As long as your emails do the same (and you aren’t emailing people 4 times a day on the regular), your customers will love getting these 10 different types of emails from you.